Vitiligo is a disorder in which white patches develop on the skin. The patches may also appear in the hair, eyes, and mouth. They may appear on any part of the body. The white patches are due to the destruction of melanocytes cells. These cells in the skin make pigment. Loss of pigment causes the skin to become lighter. It looks especially lighter compared to normal skin nearby. This is why vitiligo is more visible in darker-skinned people. It is likely that a genetic defect make the cells more vulnerable to damage. White or prematurely graying hair and hair loss may also occur. Vitiligo often begins with a rapid loss of skin color. This is followed by a long period without any change. Cycles of pigment loss and stability may occur again later. The cycle can continue throughout life. About half of the people with vitiligo have their first pigment loss before age 20. It is rare for skin color to return without treatment. The doctor will ask about your symptoms and medical history. A physical and eye exam will be done. The diagnosis is usually made by the appearance of the skin. A skin biopsy may be done to confirm. Special UV lamps may be used during skin exam. Blood tests are often taken to look for signs of autoimmune diseases. PUVA used to be the most common type of repigmentation. Now it is being largely replaced by narrow band UVB (nbUVB). You apply a psoralen cream or take a psoralen medication orally. You then expose yourself to UV light A (UV-A) from the sun or an artificial source. The medicine is activated by UV-A. It may repigment white patches. This treatment takes months and can cause sunburn-type reactions. It may also cause nausea and increased risk of skin cancer. This is a special UV laser. It is shown to be effective in localized cases. Corticosteroid skin creams — can sometimes slow the loss of color. It may also help return color to small areas. They may also cause thinning of the skin. Tacrolimus or pimecrolimus skin creams — can sometimes slow the loss of color. They can help return color to small areas. They may also cause thinning of the skin. 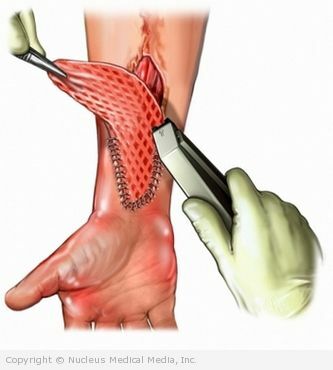 Skin grafting — done if the condition is not widespread and stable. It may be possible to graft areas of normal pigmentation to the patches. This involves removing the remaining pigment from your normal skin. This treatment makes your whole body the same white color. It is only done if you have already lost a large amount of your normal skin color and repigmentation has not been successful. The medicine used is called monobenzyl ether of hydroquinone 20%. This treatment takes about one year to complete. It can cause side effects, such as redness and swelling of your skin. You can make your white patches less noticeable. Makeup, dyes, stains, or self-tanning lotions can work as a cover. However, the color from dyes, stains, and lotions slowly wears off. Depigmented areas are at much higher risk for skin cancer. There is no known way to prevent vitiligo. It is important to protect the depigmented areas from too much sun exposure. Wear protective clothing. Apply sunscreen. Some other medical conditions occur more often in persons with vitiligo. Your doctor will likely ask about symptoms that might indicate a vitiligo related disorder.